The vertebral column is made up of 26 bones that provide axial support to the trunk. The vertebral column provides protection to the spinal cord that runs through its central cavity. Between each vertebra is an intervertebral disk. The disks are filled with a gelatinous substance, called the nucleus pulposus, which provides cushioning to the spinal column. 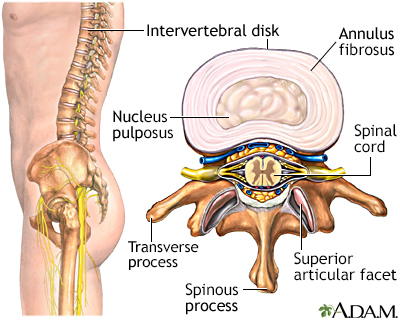 The annulus fibrosus is a fibrocartilaginous ring that surrounds the nucleus pulposus, which keeps the nucleus pulposus in tact when forces are applied to the spinal column. The intervertebral disks allow the vertebral column to be flexible and act as shock absorbers during everyday activities such as walking, running and jumping.